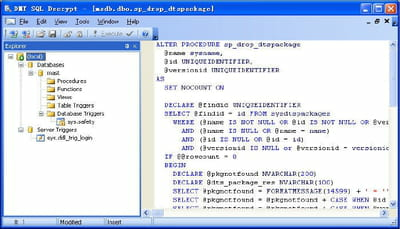 DMT SQL Decryptor was designed by DMT Software Inc. in order to allow the users to decrypt stored databases in SQL Server. It decrypts procedures, triggers, views and user defined functions. Decryption: The decryption process is very simple and easy by just making one click. The program supports full Microsoft SQL Server 2000, 2005, 2008 and 2012. No matter what the size of the data is, it is always possible to decrypt and view them. Exportation: Decrypted data can also be exported. At the beginning, they might be in other formats but the user can export them to Rich Text Formatted and HTML Documents. The syntax is high lightened for the user to be able to read it easily. Editing: DMT SQL Decryptor gives also the possibility to edit the exported files. This is doable thanks to the built-in SQL Editor which also enables to execute database object script. The software is easy to manipulate. The user does not need any prior knowledge of database scripting. DMT SQL Decryptor here is in a shareware version. Latest update on June 14, 2015 at 01:19 PM.